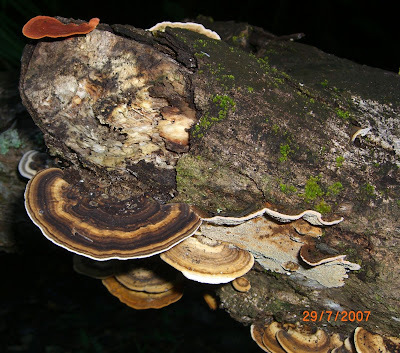 For some unknown reason MB is always fascinated with the fungi that grows on dead trees. She spotted a fallen log this morning at Mt Whitfield that had at least 3 different varieties of fungi growing on it, one colourful variety was nearly as bright as dayglo orange. If only we could grow that other dead wood loving fungus, shiitake, in our climate, alas too hot in FNQ for this delicacy. Next time maybe try the Blue Walk - seems more testing. Perhaps the fungus would benefit from a spray of the Japanese deodorant.